A. Installing new exterior concrete is an expensive undertaking, and you want it to last. Hopefully, your concrete contractor has more insight than Carrie’s. If not, here’s what you need to know. Concrete is very strong if you try to compress or squeeze it. But it’s weak if you try to bend or stretch it. When you bend or stretch concrete you’re applying tension to it. In fact, normal concrete only has one-tenth the strength in tension as it has in compression. Carrie’s contractor may be pouring concrete that has a compressive strength of 4,000 pounds per square inch (PSI). That means it only takes 400 PSI to crack it. Standard reinforcing steel rods have a tensile strength of about 40,000 PSI. You should be able to see immediately it’s a good idea to use steel in concrete slabs! You can use either 1/2-inch diameter steel rods in concrete or rolls of steel mesh that look like a giant piece of graph paper. The grid is 6 inches by 6 inches. In either case, you want the steel to be installed such that the concrete surrounds the steel by at least 1 or 2 inches. 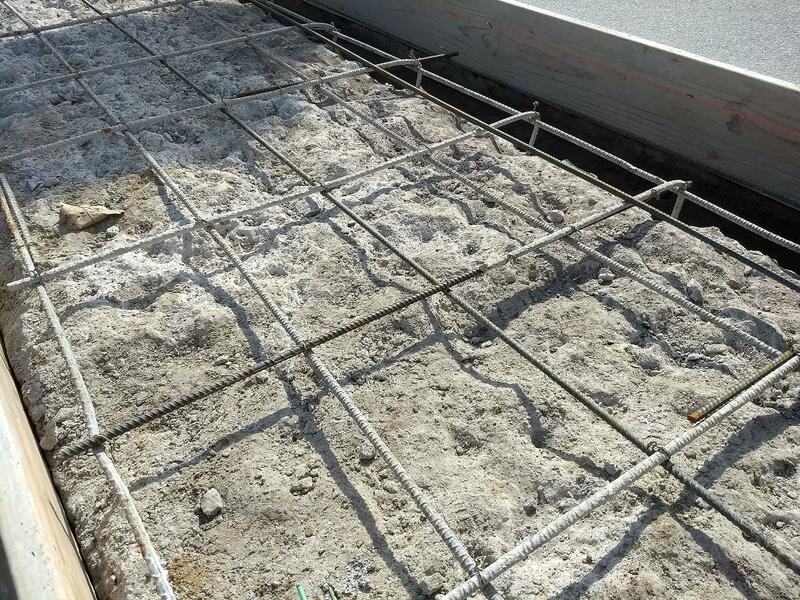 Slabs that have concentrated loads and pressure from a certain direction will require the steel to be placed at a specific spot. Structural engineers will specify the exact placement of the steel in these situations. You don’t need to be concerned about that for most residential work around your home. If you’re pouring a 5 inch thick slab for a driveway, sidewalk or patio, just be sure there are at least 1.5 inches of concrete that will flow under the steel. I like to place steel rods at 2 feet on center in both directions in my exterior slabs. The benefits are tremendous. Since concrete shrinks 1/16 inch for every 10 feet you pour, you know it’s going to crack. The steel keeps these cracks paper thin. Steel also prevents offsetting, where one part of the slab rises higher than the part on the other side of a crack. A. The contractor involved here is probably the cousin of the carpenter who put the railing on my house in New Hampshire. It’s important to realize that I didn’t build my house, and in the purchase contract I pointed out the unsafe railing to the owner. Notching deck posts is a very unsafe practice. When you remove wood, you are removing strength. Lag bolts are perhaps the worst fastener you can use for a deck post. Lag bolts can be overtightened and lose much of their holding power. There are many code-approved methods to attach a deck post. Keep in mind the building code requirement for deck railing is a minimum requirement. This means that if you design and build the railing to meet code, it’s like getting 70 percent on a test. You just barely pass. You can always build better than the code requires. I feel the best method of connecting wood deck posts to wood deck undercarriage is to use metal deck tension tie connectors and through bolts. The deck tension tie connectors resemble joist hangers, but they’re installed on the side of the deck joists instead of under them. Special heavy-duty bolts anchor the connector to the side of the joist and a through bolt passes through the outer deck rim joist, through the deck railing post and finally through the metal tension tie. For the railing post to fail, it must rip the tension tie out of the joist. If you want to watch a short video showing horrible notched deck posts and the very cool metal deck tension tie you should be using, go to: http://go.askthebuilder.com/deckpost.